This post tracks progress on my Good-to-VG set of 1971 O-Pee-Chee's low series (#1-523). While the set's complete by number, I'm upgrading several of its Poor-Fair cards to "intact," with no paper loss, trimming, writing. (Creases and other handling wear are fine.) Comment here or email if you've got some hits to trade! COMPLETED at the 2015 National by Sal Domino of OldBaseball.com, who hit me six times. Thanks Sal! 1971 represents O-Pee-Chee's first push for a real Canadian identity. 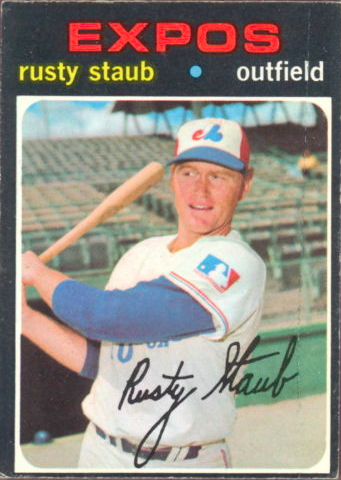 Montreal-based card editors shaped the set to better serve local fans, so several things stand out from past adaptations of Topps' own design. 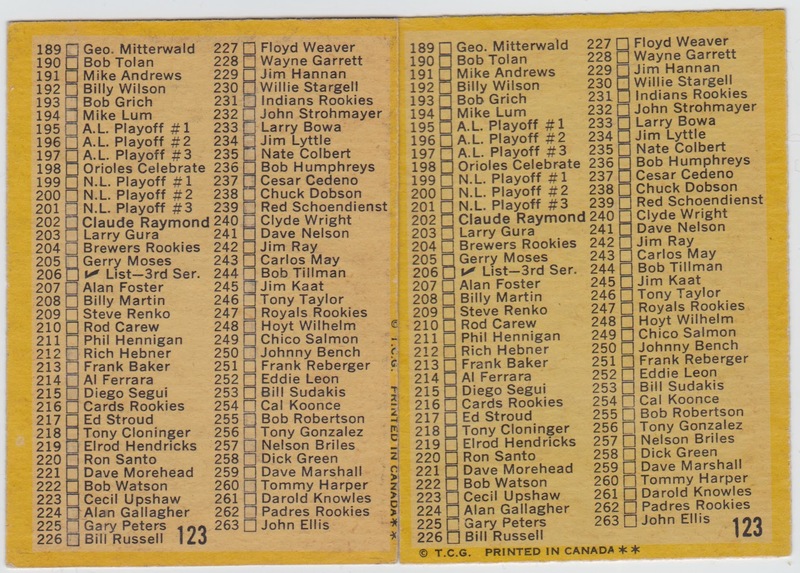 From 1965 to 1970, O-Pee-Chee collectors saw a subset of American cards, in part because hockey dominated local sports pages prior to 1969's expansion into Montreal. 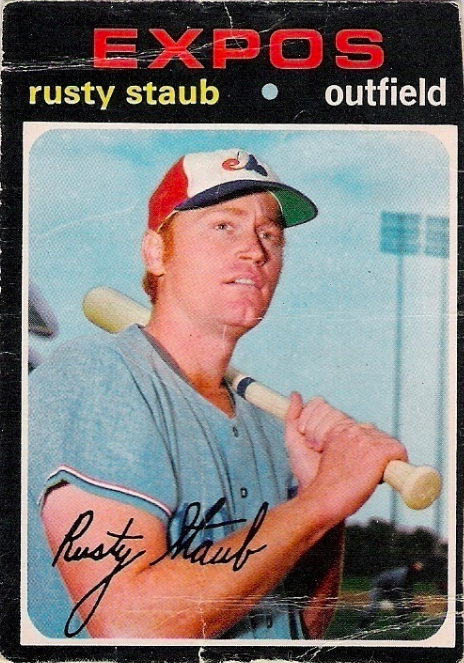 This 1971 set went the full monty, matching Topps card-for-card in total count. O-Pee-Chee honored Canada's Official Languages Act by adding bilingual French-English to #1-523 card backs. This reinforced local fan identity and gave other collectors a start on Quebecois ice breakers like "Pardon moi, etoile de la L.N. en 1966? Oui?" I assume OPC ran out of time or money to translate its #524-752 high series into French, so they match Topps apart from that yellow background. This group's many times rarer than #1-523, so I don't even attempt to complete them anymore, low grade or not. A handful of Montreal players get extra love for their Canadian roots, displacing World Series highlights, team cards, and others seen stateside. The indispensable Oh My O-Pee-Chee! 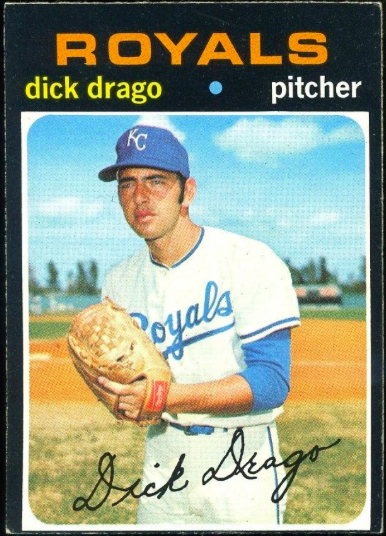 cataloged every Topps/OPC variation, 1971 included, and OPC collectors should be all over that blog if you missed it up to now. People still open packs older than me! 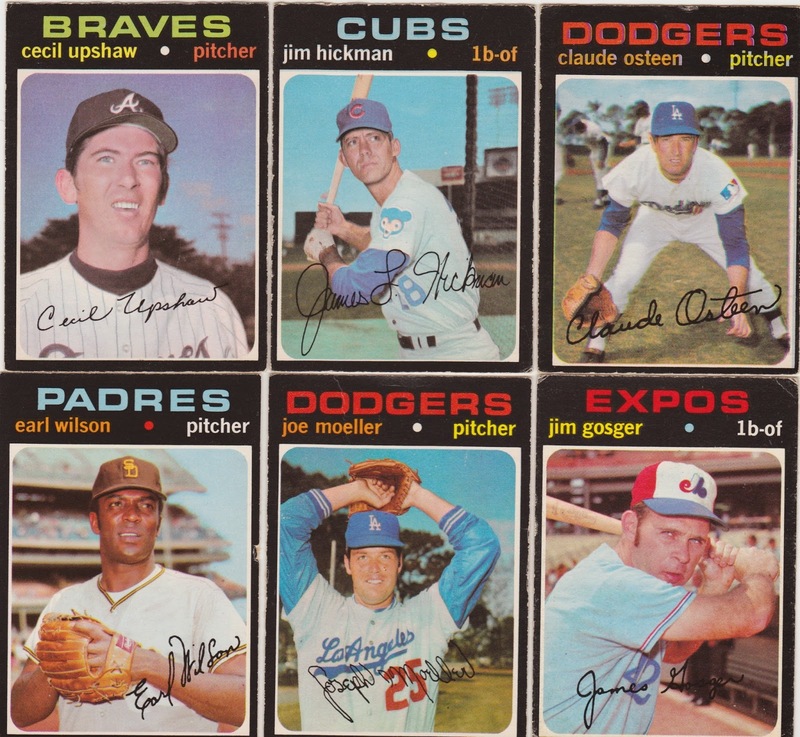 Note that 1971 OPC wax includes Baseball Story booklets first seen in 1970 Topps. 1971 Topps/OPC #5 shows Munson tagging out A's pitcher Chuck Dobson in one of my favorite vintage action photos. And how about that trophy? And that elegant autograph? A+. Feb 13: OldBaseball.com friend and OPC collector Gord Ellis said he didn't know which #123 Checklist I needed, so sent both variations! Thanks also to fellow OldBaseball.com friends Mark Talbot and Richard Dingman for help with past 1971 upgrades! Mar 14: Found three hits via the Beckett marketplace, including HOF Billy Williams. 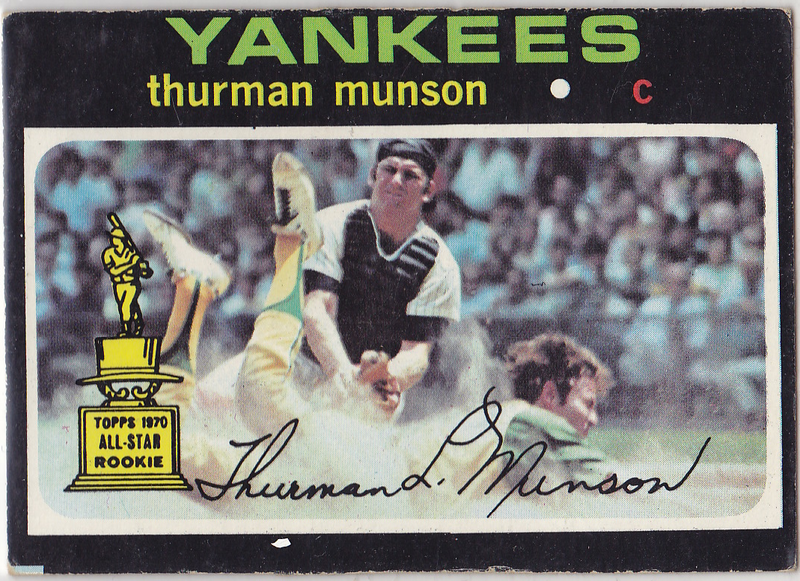 Mar 31: Won this $13 Thurman Munson on eBay! Might break it out of the holder just to get a better scan and put it in the binder. Also found another dozen cards that could use replacements, so the list grows. Have I started down the slippery slope of upgrading? Apr 6: More upgrades from the Beckett.com marketplace! 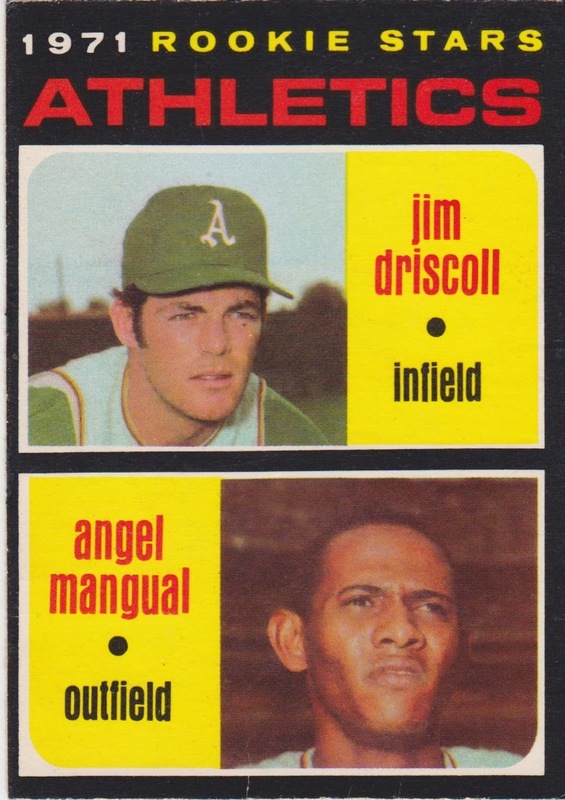 One card stood out, as I'd never heard of Angel Mangual, despite completing every 1970s set over the years and, as it turns out, his significant role for Oakland's back-to-back-to-back Series wins. The meat of Angel Mangual's career spanned Oakland's 1972-74 title run and he even singled home the game-winner in 1972's game 4, their last of four straight pinch-hits. Here's the at-bat as it happened, via MLB.com. Won't forget you again, Angel! Dec 5: Two singles found on eBay, #344 Ellie Rodriguez and #428 Jim McAndrew. July 29: Last six hits from Sal, including Rose and Jenkins!